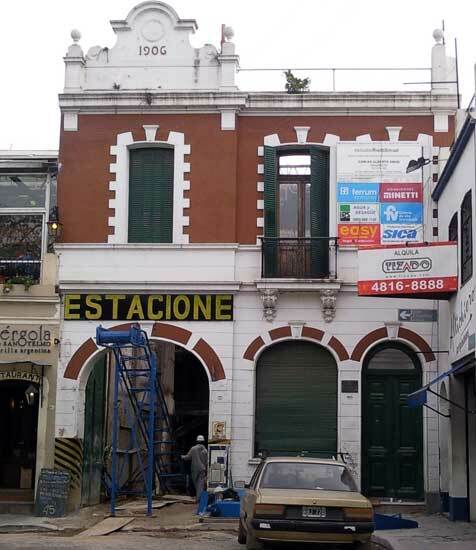 El artículo titulado “Vidrio del pozo de basura de la calle A. Aieta 1067” es un informe presentado por Nicole Mathwich para la Dirección General de Patrimonio e Instituto Histórico de la ciudad de Buenos Aires el día 29 agosto 2011. Anselmo Aieta 1067-1069 is located in the Plaza Dorrego of San Telmo, and the glassware is primarily from a period before 1907, when the well was covered by construction. The upper part of the fill dates to pre-1971 when the property was turned into a parking lot, the asphalt serving as a cap to both fills. The only owner that has been attributed to the property in the 19th century is the Migues family in 1850, and the well was the back portion of the property. From the amount of garbage in the well, it was likely a latrine in the 19th century (. In 2010-2011, the property has been under construction, and a rescue excavation collected a variety of materials from the well. During construction however, the well was dug into, and although this exposed the well in profile, it destroyed much of the possibility for understanding the well stratigraphically.The excavation, was however, poorly recorded and poorly executed. The materials in these preliminary observations are based on the glassware from the collection. Because there is a cap from the construction of 1907, the materials that straddle the 19th and 20th dates are likely from before this date. There is significantly less material from the end of 19th century, and this could be due to a variety of reasons. It could be that the site had fewer people living there, or the deposition of waste was moved to another place, or incinerated locally (Camino 2009, 102), or the well fell into disuse following updates to the city sewer system and changes in legislation prescribing the use of aljibes over pozos (Schavelzon 2005). Less glass from the latter half of the 19th century likely reflects the influence of a metropolis changing how it disposed of its waste and how water was distributed in response to an expanding population. The glass from A. Aieta 1067 seems to follow the typologies of Paula Moreno 1(1994, 1997) in the cases of gin bottles, cylindrical English wine bottles (52+) and cylindrical French wine bottles (23+). There are also at least 25 transparent glass bottles found at the site. These are approximations because the analysis of the bottles is incomplete at the day. There are likely several more in each category, and it does not include the other various types of glassware from the site, which includes drinking glasses, tumblers, perfume bottles, jars, and decanters. The most numerous glassware, apart from the many body fragments, were bases of cylindrical bottles, being more both durable and more diagnostic. Unlike the bases of the demijohns (damajuanas), which were broad and thick, but easily fragmented, the bases of the cylindrical wine bottles from the XVIII and XIX centuries from both France and England were more often intact than fragmented. The pattern in alteration is similar to the observations glass deterioration by Traversa et al. (2002).The dark green wine glass was best preserved, and had the least amount of vitrification, while the lighter green glass and the clear glass had more vitrification. Of the wine bottle fragments, the majority display sand pontils, bulging bases, and early 3-piece mold pushups, bulging necks, down-tooled lips from finishing tools and thus were likely made between 1790-1850. Of the neck finishes and bases, there were several examples of 3-piece mold and certain finishing tools which appeared after 1810 and 1820. This pre-1850 date means the bottles are most likely English because they were manufactured before other European and American factories began imitating the style (Lindsey 2011). Of the gin bottles fragments, likely originating in Holland or England, there were 12 bases with pontil marks and 4 without. Of the necks found, there were 9 with a rudimentary lip, dating before 1850, and one that had been finished with a specially designed shaping tool dating to post 1830 (Moreno 1997). Nearly all, as far as it could be determined, were in the tronco-pyramidal shape typical of the 19th century. The concentration of French wine bottles fragments was about half pre-1850 and half post-1850, which could be determined by the presence or absence of the pontil, and the techniques used to finish the lips, ranging from a crude string rim to an applied and tooled champagne finish to semi-automatic industrial lips with beveled rims. The shapes of these bottles all fell under the category of Bordeaux or Burgundy shapes, with 3 exceptions. Three neck fragments were from Hock shaped bottles which developed after 1820 for Rhenish white wines (Lindsey 2011). Of the clear bottles, 4 displayed pontil marks, and the other 6 showed signs of having been produced in a mold and 1 might have been produced semi-automatically, based the thickness and color of the glass and the type and shape of the base. “Chateau Haut-Brion” was a brand of one of the wine seals found at the site, which was a French wine of high quality in the 19th century. The seal probably dates to post-1850, when the bottles were first noted to have the seal and be exported to the United States and was produced in greater quantities (“Chateau Haut Brion” 2011: 17). A maraschino liquor bottle produced by the manufacturer Millicich from what is now Croatia was probably produced between 1870-1910, given quality of the glass and the mold marks. A minimum of 4 Quilmes dark brown red glass beer bottles were found, fabricated after 1890, along with what is likely a Cerveceria Palermo bottle, some of the few pieces of glassware that can directly be attributed to having been made in Buenos Aires. One ceramic stopper with “Quilmes” written on the top was found as well, but is with other ceramics, although it was likely used a cork for a glass bottle. Three other 3 dark brown bases were found, but were not as diagnostic. It might seem from the glassware here that wine and liquor were far more popular beverages, however, the amount of beer containers must also be understood in relation to the large number of ceramic containers of which there are 30+ and their analysis ongoing. One bottle and one fragment (MNI: 2) were from the Bordeaux company of Delor who exported wine and aperitifs from 1850-1950, and the two bottles were probably manufactured between 1870 and 1910. There also was one example of a late 18th century perfume bottle made in a mold with a fountain motif on the front and on one side. The glass is thick and vitrified, and with mold lines and pontil that has been smoothed over. Above is an incomplete collection of observations about the glassware of A. Aieta 1067. The concentration of the material is prior to 1850 and is European in origin, with national material appearing in small amounts towards the end of the 19th century, which reflects the patterns observed by Traba and Ansaldo (2008). The glassware seems to be mostly associated with the storage and serving of liquids, especially alcoholic beverages. It is difficult to say what kind, because although there was most definitely wine, beer, bitters, and gin consumed, cider was probably a part of the that list, and the bottles were likely reused, which makes there actual date of use and utility one that is very different from the fabrication date. From existing literature, the materials here reflect the 19th century San Telmo household, with items that are decorated, but not overly ornate, primarily foreign in origin, and mostly associated with beverage consumption and storage. For example, there were no fragments that could be positively identified as originating from lamps or lighting fixtures. The vast majority of the glass items were made in a mold or in some pre-industrial manner that was aimed at mass-consumption. Fine wines like Chateau Haut-Brion are present with a variety of French bitters and liquors from Europe, demonstrating the variety and quality available. An analysis of the faunal remains and the cuts of meat that were purchased in conjunction with the quality and prices of the glassware alongside extended historical research, would help to determine the social-economic of the people who lived there. Unfortunately, the lack stratigraphic context in the rescue operations of these items makes this nearly impossible to do with any accuracy. From the dates obtained from the glassware, a large portion of the material possibly coincides with the Migues occupancy. As for the age, gender, and cultural identity of people that were using these items, no items indicated any identity in particular. There were no toys, and no items obviously “feminine” or “masculine.” Even though much of the glassware was probably manufactured in France and England, that is not mean that anybody in the household was from those places. There were many cups and jars for serving liquids, some of which appeared to part of a set, indicating these people were probably not consuming these the alcoholic beverages alone, but in the company of others. It is difficult, however, to say anything about the people who used and disposed of the glassware at A. Aieta with a great deal of certainty. Because the fabrication date of some items is clearly before 1810, when Buenos Aires opened its ports officially to international trade, it is possible that some of these imported items were obtained through smuggling, although it is difficult to determine which and in what quantities. This is an interesting pattern of behavior that merits more investigation in San Telmo. Moreno (1997), for example, dates all of the gin bottles with pontils between 1810 and 1850, however this is probably not the case, although I used her dates in the table for lack of anything better. The style of the bottles could go back as far as the 1790s, and the English wine bottles to the same time period and earlier in the 18th century. Traba and Ansaldo (2008) noted the primacy of and preference for European goods continued in to the 20th century. As an American with a little background in archaeology, I find this interesting and difficult when studying the glassware, because there are certain technological developments that appear earlier in the American archaeological record but later in the European. On top of that lag, there was also the time lag of the fabrication and active use of the glassware to its deposition. It is possible that a bottle of fine French wine was saved as memorabilia or the English wine bottles were refilled local beverages for many years. The consumption patterns of a periphery country, far the centers of production make use and deposition of glassware very complicated. At the same time, imported goods were arriving in great quantities in Buenos Aires soon after production in Europe and were likely used close to the time of arrival. What happened afterward was determined by the social context of period, and this collection cannot offer many clues to that type of behavior. 2011 Society for Historical Archaeology. Historic Glass Bottle Identification & Information Website. http://www.sha.org/bottle/index.htm. 2009 Relleños Porteños. Revista de Arqueología Histórica Argeninta y Latinoamaericana 3: 101-123. 2004 Intersecciones antropol. El proceso de descarte de basura y los contextos de depositación presentes en la ciudad de Buenos Aires. [online] 5:19-28. 1970 A guide to artifacts of colonial America. 1st ed. Knopf, New York. 1986 Cylindrical English wine and beer bottles, 1735-1850. Series: Studies in archaeology, architecture and history. Minister of Supply and Services, Ottawa. 1985 The Parks Canada Glass Glossary. Research Publications Parks Canada, Ottawa, Canada. 1994a Processos de manufactura y fabricación de vasos y copas. Fines del siglo XVII y XIX. Facultad de Arquitectura y Urbanismo, Universidad de Buenos Aires, Argentina. 1994 Estudio tipológico de bases y picos de botellas de la Imprenta Coni y de San Telmo. Historical Archaeology in Latin America I: 103-123. 1997 Botellas cuadradas de ginebra. Buenos Aires, Argentina. 1991 Arqueología histórica de Buenos Aires I. La cultura porteña de los siglos XVIII y XIX. Buenos Aires, Argentina. 2005 Sacando agua y basura en Buenos Aires (siglos XVI al XIX): algunas experiencias arqueológicas. http://www.iaa.fadu.uba.ar/cau/?p=1834#more-1834. 2008 En Buenos Aires no comen vidrio pero lo consumen. Una mirada a la vida porteña a finales de siglo XIX. 9-11 noviembre Estudios vinculados con la durabilidad de vidrios de interés arqueológico. In Arqueología histórica argentina: actas de 1er. congreso nacional de arqueologia histórica, 607-612. Corregidor. Historia previa ¿Un exorcismo no reglado en el convento de Santa Catalina durante el siglo XIX (Buenos Aires)? 4° piso, Pabellón III, Ciudad Universitaria. Licencia Creative Commons Atribución-NoComercial-SinDerivar 4.0 Internacional.